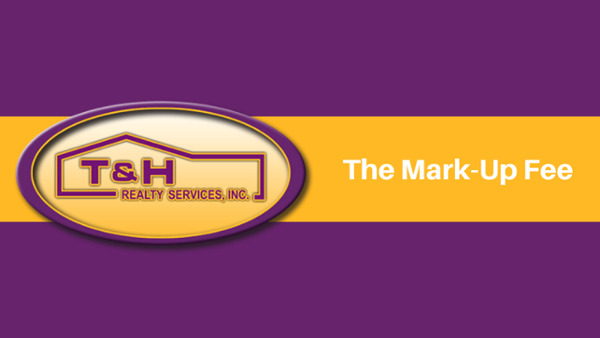 T&H Realty Services - How Much Is The Mark-Up Fee? In this blog, we want to discuss our mark-up fee. A mark-up fee is a small service fee that property management companies add to all bills that are paid on behalf of an Owner. Our Mark-Up Fee is 10% of the bill paid. This is applied to any non-maintenance related bills that flow through your account. We do not mark-up any bill associated with maintenance. Related: Does T&H Realty Make Money on Maintenance? This fee compensates us for the administrative cost in managing certain activities on your home and paying those associated bills. Examples include utility bills, HOA bills, legal fees, etc. It is very common for professional property management companies to charge additional fees besides the monthly management fee. Some companies charge a multitude of ancillary fees, such as set-up, marketing, and vacancy fees, which we do not charge. We chose the bill mark-up system to be simple, transparent, and fair. We believe in only charging fees when there is an activity that warrants it. That means we keep your total cost as low as possible and you are not charged for us doing nothing. In addition, to be totally transparent, we also post vendor bills and maintenance requests to your on-line account portal, which you can see 24/7. That way you see all activities and actual cost for the bills that are charged to your property. For a comprehensive look at our pricing structure, check out our Pricing Page! If you have any questions about on mark-up fee on bills, please don’t hesitate to contact us. T&H Realty Services - How Much is the Management Fee? What If a Tenant Destroys My Indianapolis Rental Home?